A fantastic collection of DaimlerChrysler wind tunnel pics. This article was first published in August 2001. This week we'll step away from the on-road wool-tuft testing that we've been covering over the last few issues. (Next week we'll again cover on-road wool-tuft testing - this time carried out on a twin turbo Mazda RX7. We'll then compare those results with data gathered on the RX7 in wind tunnels.) But in this article we'll look at a whole host of wind tunnel and computer simulation photos recently released by DaimlerChrysler. The wind tunnel photos are fantastic - they show wonderful patterns of streamlines highlighted by smoke testing. And the computer simulations? Even better, as they depict stuff normally never seen - air patterns through engine bays, for one! Photos as clear and detailed as these are rarely made public - usually after the release of a new car model, there's just an obligatory tiny photo showing a car in a wind tunnel, and that's that. So it's worth taking the time (and expanding the shots) to look very closely at these unique pictures. If you have read the preceding parts to this series, you will be aware that a major determinant of drag is the cross-sectional area of the wake. If the airflow does not fill the space behind the car, a low-pressure area will exist there - and pulling that low pressure along creates drag. So in three-box sedan shapes, manufacturers strive to retain attached flow right down onto the boot lid, decreasing the size of the wake. Obviously that process is not possible in two-box shapes, such as wagons. Smoke testing can be used very effectively to show the size of the wake, both by indicating where streamlines separate from the body and also - even trickier - by showing the extent of the wake by filling it with smoke. The wind-tunnel tests like this are almost always done with zero yaw angle (ie the car is facing directly into the wind, or to put it another way, there's no cross-wind component). As can be seen, the very lowest smoke line (you'll need to look hard to see it) passes beneath the car, while the one above that disappears into the lower cooling opening. The next highest is much clearer - it shows attached flow across the bonnet and up the windscreen onto the roof. However, the smoke is a bit deceptive - it looks as if the airflow separates at the end of the roof, when in fact almost certainly wool-tuft testing will show attached flow on at least the rearmost part of the boot lid. However, to be in a strong, non-turbulent airflow, you can see that a rear wing would need to be perhaps 250mm above the rear lip of the boot. Note also that this type of centreline smoke tracing doesn't really show a great deal of what's going on - you can't see the airflow wrapping around the C-pillars onto the rear window and then boot lid, for example. Also, smoke testing is done at very low airspeeds. A very similar story can be seen here, with the stagnation point at the front of the car (the zone above which air goes over the body and below which it goes under the body) more clearly able to be seen. The contrast in flow over the rear profile of a fastback shape can be clearly seen here - without any doubt, the flow remains attached right to the tail of the car. Note also the way in which the rear shape actually creates a 'virtual' shape which is a little different from that in the metal - the air is acting as if the tail is actually a bit higher than it really is, with the smoke then being drawn down a little into the low pressure wake. Before they build the full-size car, many styling models are wind tunnel tested. It's interesting comparing the smoke trace airflow of this model with the same life-size car in the pic above. As you would expect from the foregoing, a wagon is always going to have a large wake - it can be interesting comparing the Cd for the wagon and sedan versions of the same car. Here the streamline clearly leaves the car at the rear spoiler - which has been placed there to give this clean separation. (If the attached flow wrapped around onto the rear window a little before leaving the car body, it would create a suction peak, increasing drag despite the slightly smaller wake. Better to flick it off!) From this image you would expect the area behind the car (ie the full width, and up to the lower edge of the rear spoiler) to be all turbulent wake - and you'd be right. The small amount of smoke being injected into the wake below the wagon's spoiler is insufficient to completely fill the wake - but you can clearly see the low pressure that's holding the smoke behind the car. That its top edge is so clearly demarcated shows that the spoiler is doing its work - the attached flow is separating cleanly at that point. The curved rear glass of the wagon is there for styling purposes only - it doesn't contribute to a smaller wake and so could have been vertical without changing a great deal of the aerodynamics. Another example of filling part of the wake with smoke can be seen here. Again note the beautifully clean separation of the attached (here it's invisible) flow. Australian readers can compare that with the shape of the trailing edge of the current Holden Commodore boot, which curves around without any sharp lip or change of angle that would allow clean separation. Open cars have particular problems when it comes to aerodynamics. Without a roof to follow, the air becomes turbulent, swirling into the cabin and also increasing the size of the wake enormously. It's not for nothing that almost all manufacturers quote drag figures of their convertibles with the roof firmly in place... However, note how the smoke is not moving forward into the cabin - the occupants are sheltered. Well, they're sheltered to a degree anyway! The smoke streamlines look really good in this shot, but it would be much more interesting to instead fill the cabin with smoke - and see how much stays in there in the low pressure turbulent area! A clue can be gained by looking at the movement of the driver's hair - and note that in both shots, the side windows are raised. It's not that DaimlerChrysler engineers are doing a bad job (in fact their convertibles have very low levels of in-cabin air movement); simply, it's very hard to get ideal patterns of airflow around the body of an open car. The airflow under the car is critical in determining drag and lift characteristics. And looking at these flow patterns is difficult - some wind tunnels are equipped with clear floor panels and researchers peer up at tufts or smoke streams from below. This pic, while dramatic, is of little use - not only are the wheels not turning (they normally create massive air movement) but the stationary 'road' is about a metre below the car! The ride height of a car dramatically affects its aero characteristics - so this pic is for fun alone. However, the small deflectors in front of each front tyre can be seen, and the largely flat floor used on most recent cars is also visible. Many 'aware' drivers - when considering their car's aerodynamics - watch the patterns that raindrops make on their car bodies. However, the behaviour of water drops and air is usually very different - the water has greater mass, surface tension and so on. 'Rain' testing is carried out in wind tunnels to assess the effectiveness of wipers and to optimise dirt deposition so that it doesn't obscure head- and tail-lights or driver vision through side windows. We said earlier that most smoke testing pics show vehicles being subjected to zero crosswind components - but not in this stunning photo. 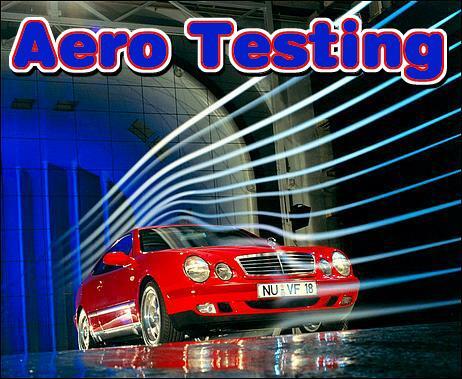 This test is indicative of a steady-state cross wind - mixed of course with the air movement generated by the car's forward motion. It can be seen that in this situation the wake of the car increases substantially, and that the airflow wrapping around the right-hand A-pillar and left-hand C-pillar adopts different angles from that occurring with a simple head-on airflow. Add gusts of crosswinds rather than a steady-state situation and you can see that making a car that is not susceptible to crosswinds is difficult. Another overhead shot, this photo shows the affects of boat-tailing (a narrowing of the car towards the rear). Most cars taper in width in order that the size of the wake is reduced. This wagon clearly shows this characteristic - the way the two departing side smoke streams head inwards is fascinating to see. This computer simulation shows the varying velocities of streamlines as the air passes through the radiator and is exhausted from under the car. It can be seen that the air slows in front of the radiator - the high-pressure area being pushed along in front of the car causing this effect. The air then passes through the heat exchangers (air con condenser, radiator, and perhaps engine and transmission oil coolers) before exiting around the engine. Once it leaves the engine bay (and look how it cools the two exhaust manifolds and pipes as it does so!) it then becomes entrained in the under-car flow (note the yellow lines) and accelerates again. Rather than letting the air that has passed through the radiator simply spill out from the engine bay, here an undertray with specific exhausts has been used. The air is guided to emerge from two openings in the tray, whereupon it again accelerates in speed. Note the slower speed in the wake behind the car. And to finish on a Mercedes theme, this wonderful old pic. Back to wool tufts - and the tales they tell. However, the area around the rear window and bootlid of the car cannot be seen - almost certainly, it is a mass of turbulence! Note the turbulence around the A-pillar (at the base on the windscreen and higher up on the side glass), the attached flow wrapping from the front guard (fender) around onto the bonnet, and the odd flow pattern around the front indicator. Despite being less fancy, in many respects wool tufting actually gives you more information than smoke testing. Next week: Comparing the results of on-road wool-tuft testing of a Mazda RX7 with its wind tunnel results.